HomeNewsEmergency PreparednessThere’s No Time Like Today to Get Prepared – Wholesale Pricing For Everyone! There’s No Time Like Today to Get Prepared – Wholesale Pricing For Everyone! You’ve done your research and found the items you need in your emergency kit. You’ve started doing a bit of shopping and maybe you’ve discovered that you don’t have the time & money to invest in going from store to store, or looking online – now what?! There’s no time like today to get prepared for tomorrow. We’re offering wholesale prices to all our customers. 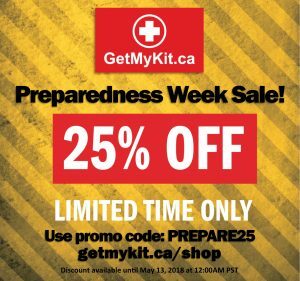 This is the SALE OF THE YEAR and it’s just in time for Emergency Preparedness Week, a federal initiative that brings awareness to the importance of having supplies and a plan for emergency situations, whether at home, on the road, at work, or at school. From May 6 – May 12 purchase your home emergency kit with us and receive 25% off your purchase. By taking advantage of this offer, you’re taking control of your home emergency preparations and ensuring the safety and survival of each member of your family. 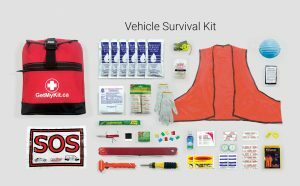 Our kits have a 5-year shelf life so your emergency supplies are taken care of for 5 YEARS. Plus, when you register your kit on your website, we’ll even send you a reminder 30 days prior to the food and water expiry. 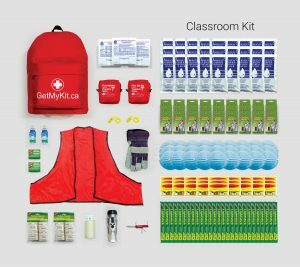 Visit getmykit.ca/shop and find your high-quality emergency kit. When you’ve finished shopping, simply enter promo code”PREPARE25” and your 25% discount will be applied to your order. We’ll ship your kits to you FREE of charge within 5 – 7 business days. It’s that easy. Home emergencies are not just limited to earthquakes. Consider fires, flooding, tsunamis, landslides and sink holes. 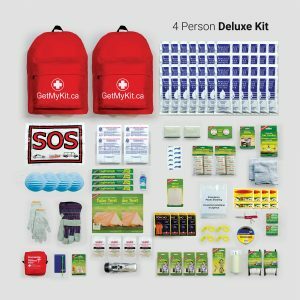 Our Home Emergency Kits include sufficient supplies for each member of your family to be self reliant for 3-5 days; food, water, first aid, temporary shelter, utilities & tools, emergency blankets, rain ponchos, hygiene, and so much more. Our deluxe kits include 15 extra essential supplies such as heating, cooking and comfort items. Let’s not forget about those fur babies – those animals that make your life a better place. Ensure that you have adequate supplies on hand in the event of emergencies for those members of your families. We offer Pet First Aid Kits which include animal CPR Instructions, a collar blinker, specially formulated wipes for their eyes, nose & ears, an emergency blanket for them and tons of other first aid items that are also valid for humans too. safety vest, multi-bit screwdrivers and 5 function army knife, fuses, first aid, emergency blanket and rain poncho, a safety hammer with seat belt cutter and window-smasher, and much more. and safety equipment for Teachers. These kits are a must-have for every classroom. Daycares are required to have emergency kits with enough supplies for each person at the centre. Our 9 Person Daycare kit includes the items that you, as a valued and trusted care provider, require. Today is the day to get your emergency kit off your to-do list. Don’t think about it another day!